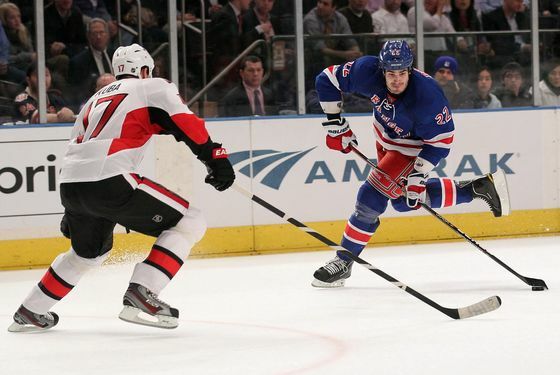 The Rangers got shut out by Ottawa at the Garden last night, ending their five-game winning streak. Games like that will happen over the course of the season, but this Rangers team — which hit the halfway point with a record of 27-10-4 — has done a good job of avoiding lengthy losing streaks. Since the first week of the season, they haven't lost more than two consecutive games, which makes this weekend an interesting one. They'll play back-to-back games in Canada this weekend, and though they're against the third and fifth place teams in the Northeast Division, both contests could prove tough. First up is Toronto on Saturday, and the Maple Leafs have already beaten the Rangers twice this season, both times at Madison Square Garden. Toronto's cooled off a bit after a strong start, but they've won their last four games, and their speed has given the Rangers problems this season. Worth noting: Toronto will be playing their second game in as many nights. Then on Sunday, they'll face the 16-20-7 Canadiens, which doesn't sound so bad, except that the Bell Centre has been a house of horrors for the Rangers in recent years: They haven't won there since 2009, and they've been shut out in three of their last six visits. Yes, Montreal is just 3-8 since hiring Randy Cunneyworth — you may know him by his full name, Unilingual Anglophone Randy Cunneyworth — but until the Rangers win another game in that building, we still consider this a tough road game. Then again, the Rangers have been excellent in back-to-back games this year, so something's gotta give. And they've played well enough over the first half that we choose to take the optimistic view heading into this weekend: Yes, they'll play a couple of potentially tricky games, but they also have a chance to bounce back from last night's loss, and maybe even get a new winning streak started. After all, this team has been surprising us — in a good way — all season long.